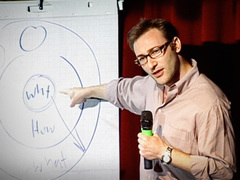 In 2009, Simon Sinek gave the talk “How great leaders inspire action” to an audience of 50 people in a small room at TEDxPugetSound. It quickly became the second most-watched talk on TED.com. Sinek, of course, felt honored by the growing popularity of his talk—and by the opportunity to inspire people to think more deeply about the sense of purpose infused in their work. But his talk had an unexpected side effect too. 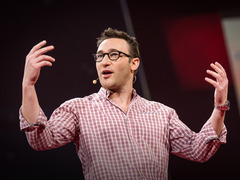 Suddenly, Sinek felt compelled by the questions: how do we know who to trust? And how can communities foster trust as an intrinsic value? In August of 2011, Sinek was invited to visit a base in Afghanistan with the Air Force, to get a better sense of the work that Airmen do. Shortly after landing at the Bagram Airfield, the largest U.S. military base in Afghanistan, the base came under rocket attack. There were three rockets that exploded—one exploded just 100 yards away from the nose of the aircraft he was on. His military companions stayed calm which, to his surprise, helped ease his fears. After a short night of sleep, Sinek and the two officers with whom he was traveling joined a supply airdrop mission, an experience that he calls amazing. This was supposed to be the end of Sinek’s trip to Afghanistan. But when the three of them got to the airport to catch a flight as standby passengers, they were bumped from their plane because the plane was making more room for stretchers. All other available flights were full. It was a Saturday—and the next flight wasn’t leaving until Tuesday. There was no guarantee they would be able to board a plane that day either. Sinek, feeling out of control of his circumstances, felt paranoia that more rockets would strike and felt convinced that they would land on him. With his mind racing, he didn’t know what to do to find a sense of calm again. He realized his symptoms were equivalent to those of someone unhappy at work, but compressed into a 24-hour experience. “When we are unhappy in our jobs, we mistake moments of excitement and happiness for fulfillment, despite the fact that we we don’t want to wake up the next day and do our job all over again,” he says. He felt like he had become one of those selfish bosses—the one more concerned about himself than others. “With no other option, I mentally and emotionally gave up. I resigned myself to the situation,” he said. “At that point, I realized I might as well make myself useful if I’m stuck here. So I decided to volunteer to help out.” He offered to sweep floors or carry people’s belongings. At that moment, one of the officers burst back into Sinek’s room and let him know that a flight had been redirected that they could get on. All three of them would be able to leave. “The reason the flight was redirected was because we would be carrying home a fallen soldier,” Sinek said. Before take off, the fallen soldier’s fellow troops did a slow eight count salute and walked away. The three of them would be the only passengers in a huge military cargo plane with a single flag-draped casket in the middle. From that experience, Sinek formed an idea: that a true sense of purpose comes from the opportunity to serve those who serve others. He noted that it’s not just the people who infuse an environment with a spirit of trust, but that the environment itself plays a role. Trust became the major theme of Sinek’s most recent book, Leaders Eat Last: Why Some Teams Pull Together and Others Don’t. It offers an evolution on his thoughts about leadership. In his original TEDxPugetSound talk and first book, he showed how the best leaders are able to articulate the ‘Why’ of what they do. In his new book, he looked at how the best leaders inspire trust in their employees and make them feel safe. After Sinek’s TEDx talk went viral in 2009, he had gotten to know TED Content Director Kelly Stoetzel. About a month after an interview published in Inc Magazine about his newer work at the time, the two met for lunch. While catching up, Sinek’s thoughts about his research on trust came up. Sinek’s new talk centered on his concept of the “circle of safety,” and how leaders can create an environment that promotes trust among employees. In his work today, Sinek continues to seek out environments where there are strong circles of safety, and opportunities to build them. Time and again, he finds that the leaders who get the most out of their people are the leaders who care most about their people, too. Een aantal interessante bedenkingen rond vertrouwen door Sinek. De achtergrond bij de video is wat me aan het denken zette. Na zijn hit-TED van 2009 kwam hij steeds vaker in contact met mensen vanuit de zakenwereld. Daar begon hij toch steeds meer vraagtekens te plaatsen bij de link tussen inspiratie en vertrouwen. Er is veel te zeggen over de zin en onzin van de oorlog in Afghanistan, toch boeiend om te horen hoe Sinek net daar merkt dat interafhankelijkheid op menselijk niveau zorgt voor sterke verbindingen, authenticiteit en vertrouwen. En hoe dat in tegenstelling is met wanneer er enkel financieel welzijn op het spel staat. be immersed in the ultimate kind of leadership! Sinek ignores the fact that the military are in Afghanistan to kill other humans!